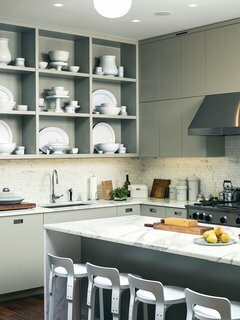 The kitchen can often be the main gathering point of a home, so why not make it stand out? He created the star as a prop for a photo shoot. 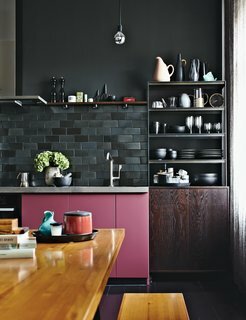 The kitchen cabinets benefit from a pop of rosy color, a custom hue. Fehrentz designed the steel-and-wood storage unit. 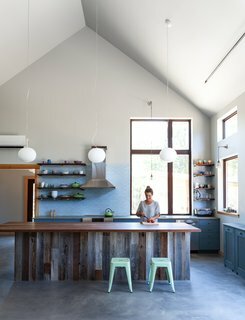 Though small, the kitchen feels generously bright. Its cabinets were custom-built by Bob Clausen, a local craftsman. 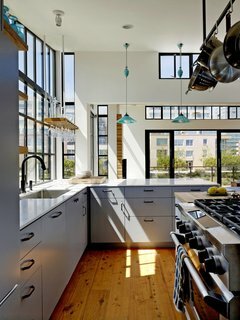 Curtiss selected sleek faucet fixtures by Santec and a sink by Blanco to complement the white laminate countertops. The stainless steel appliances include a Bertazzoni oven, Fisher & Payel refrigerator, and Thermador dishwasher. 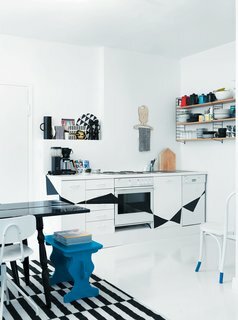 In the kitchen of this tightly-packed apartment in Helsinki, Finland, Susanna and Jussi tore down the ceiling and wall cabinets with the help of Jussi’s father, a skilled craftsman. "Behind the cabinets we found lovely little nooks that work perfectly as shelves for things like salt and pepper mills. When you strip everything to its original state, you are able to see what the house is truly about." 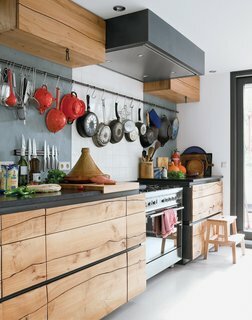 Custom kitchen cabinets designed by Pulltab and fabricated by Maciek Winiarczyk hold mostly vintage ironstone that Geiger has found at flea markets and estate sales over the past 20 years. "I love white," she says, "because I think food always looks better on it." 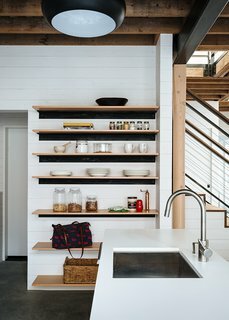 She also collects vintage wooden cutting boards, shown resting against the marble tile backsplash from Stone Source. 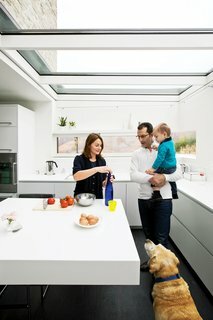 The architect placed the windows at Sabrina’s eye level so that she’d be able to see her son, Rocco, playing in the yard outside. "You can feel the seasons changing here," says Chiavelli. "I grew up three miles from here, outside in nature. This is a house for experiencing life." 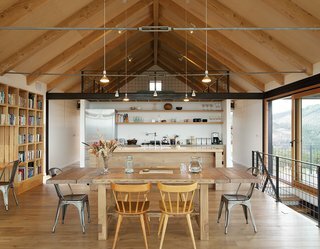 The cooking/dining space is the heart of the house, and is open to the elements. 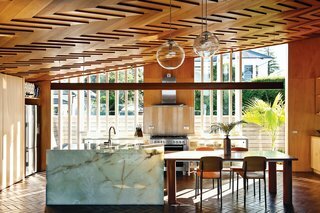 In the kitchen, the showstopping ceiling’s herringbone pattern is echoed by the terra-cotta tiles on the floor. 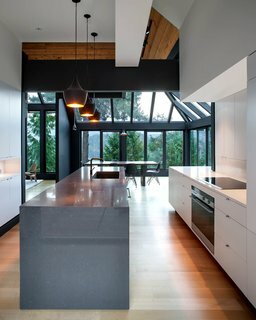 Architect Michael O’Sullivan, who designed the steel-and-glass kitchen cabinets, the table, and the pendant lights (made by Lava Glass), further amped up the richness of the room by specifying an onyx kitchen island. 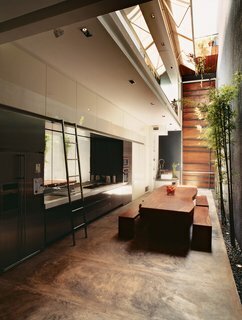 Interior designer Yvette Jay, a collaborator and classmate of O’Sullivan, kept her material palette "tight and limited. I had to restrict myself so that everything here ties in with the architecture." The residents collaborated with the architects to achieve the sharp graphic sensibility they desired. 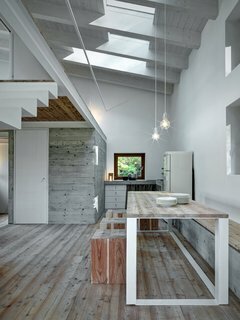 Part way through the project, they realized the space would be more compelling in muted tones. Del Gaudio made the pendants in the kitchen from rayon electrical cord, ceramic sockets, and Satco Par38 bulbs. 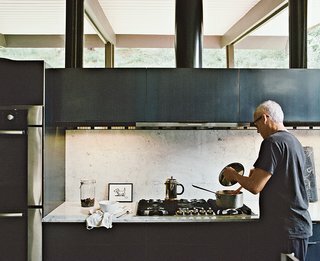 She also designed the kitchen casing, which was fabricated locally in American black walnut left over from the floor. A mix of seating—vintage Paul McCobb Planner Group and newly purchased metal Tolix chairs—are arranged around a dining table from Restoration Hardware. 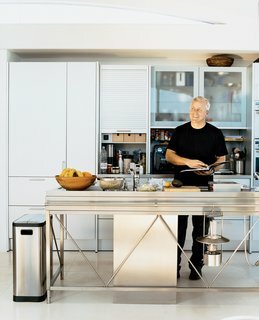 Opening onto the open-plan living and dining rooms, the aluminum Bulthaup System 20 kitchen with its nine-foot-long stainless steel island and Miele appliances has become a focal point of the house. Pressed in one seamless sheet of steel, the island, Picard says with the obvious pride of a satisfied customer, "is an amazing piece of engineering." 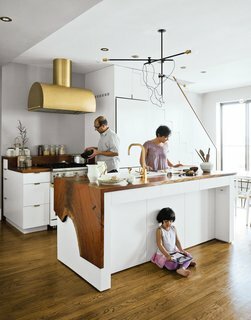 The Mandayam–Vohra family's Brooklyn kitchen is highlighted by a gold hood that complements Workstead’s signature three-arm chandelier, shown here in its horizontal configuration. 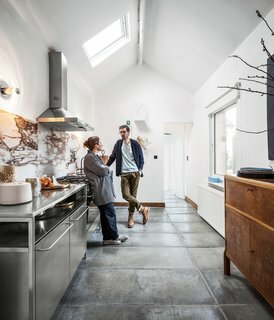 A sturdy concrete countertop curves around the entire length of the kitchen, finished in a texture Webster describes as "bug splattered." Despite the unappetizing name, it works well for rolling out dough. Its circular motif reappears in the custom cabinets’ finger pulls, which also help ventilate the cupboards. 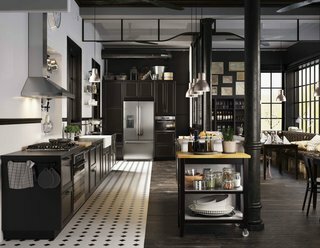 The fixtures are from Kubus and the appliances are from Miele. 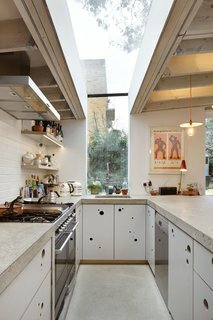 Aumas designed the kitchen island, which is covered in marble tiles from Carrelages du Marais—the geometric floor tiles are from the same place—and strung the matrix of lights up above it. 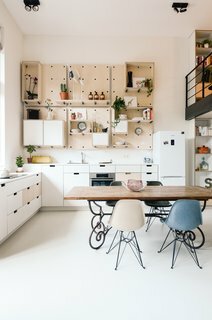 The barstools by Charlotte Perriand were discovered in a vintage store in Antwerp, Belgium. 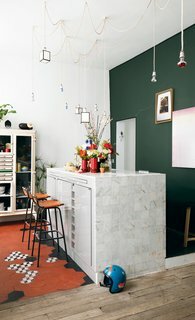 The green wall is covered in paint from Emery & Cie.